I tried to have a discussion with a few friends of mine about the Wikileaks scandal and Assange’s arrest. My argument was against censorship and the slow errosion of our freedoms for the past 9 years. A Republican friend’s argument was that she would rather have to jump through hoops at every turn if it prevented a terrorist attack. I countered with the Benjamin Franklin quote, “Those who would give up essential liberty to purchase a little temporary safety deserve neither liberty nor safety,” and said that I would almost rather there be another terrorist attack then slowly lose my rights one by one. That’s where she invoked the third rail of debate: 9/11. The conversation immediately descended into the depths of hell, with several other Republicans coming to her aid. A few of my more liberal friends came to mine, and it turned out that NO ONE was really discussion the issue at hand: Is what Assange did really illegal? If documents written by the government of and by the people are taken by one of those people, is it really stealing? How do documents become “CLASSIFIED”? Who decides on the Constitutionality of that classification? The important thing is this: If every time we attempt to have an adult conversation someone decides to end the discussion by screaming, “REMEMBER 9/11,” nothing will ever be discussed, let alone agreed upon. The constant steering of political discussions to the irrelevant (especially since the wars fought and most of the security decisions made since have NOTHING to do with the terrorist attacks) makes us all sound like children and does not further discourse in any way. A nation divided we definitely are, and I fear, a nation divided we shall remain. An top intelligence official for the US government is saying that it’s time that Americans start redefining their view of privacy. Basically this means that we’re being asked to give up more of our freedom and more of out privacy so that the government can go on a witch hunt. Who knows what they’ll be hunting. Now it’s the “terrorists“, except that evidence is mounting to suggest that the 9/11 attacks had little to do with terrorism. Next it’ll be people suspected of doing anything illegal – selling pot, downloading music, etc… We have to speak up now, before it’s too late. The more I read about 9/11, the more I hear that President Bush lied and the 9/11 Commission was given false and misleading information concerning the attacks and the clean-up effort. We’re seeing some of the lies cost more lives as the 9/11 First Responders continue to die from a variety of lung diseases and more soldiers are killed in Iraq (the country that did not attack us) every day. It amazes me how man people just accept that what they were told was the truth and few people (aside from us bloggers) seem to be asking any real questions. What really happened and who was truly responsible should be a leading issue in this Presidential Campaign, but it’s only mentioned to give candidates a boost in the polls. 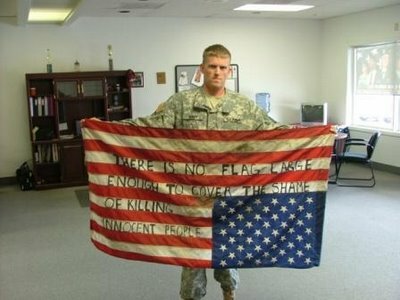 The war in Iraq is not going well, and it couldn’t possibly be due to anything the US is or is not doing. No. The problem in Iraq is… IRAN. That’s right, folks. The US Generals left in Iraq are now telling us that one of the reasons they can’t “get the job done” in Iraq is because weapons and money are pouring in from Iran. Though the President of Iraq is currently denying ANY involvement, I can’t imagine this will have much impact if President Bush decides that he wants to start another war. Let’s remember that we went into Iraq even though they had NOTHING to do with the attacks on 9/11. We have to impeach Bush and Cheney now, before they have the opportunity to do any more damage. Even if we can’t get them out of office, the procedings should keep them busy enough to prevent them destroying us completely. I first saw this at The Department of Homeland Security. The Constitution and Bill of Rights are dead. Incredibly, just as was the case when Rome’s Senate voted to make Caesar the Emperor, the United States’ Senate voted to surrender the rights and liberties of every American citizen. By a margin of 60-28, the Democratic-led Senate gave George W. Bush the unconstitutional authority to spy, without warrant, on whomever he chooses. That includes U.S. citizens, but everyone is pretending that isn’t the case. Feel free to label this analysis and the author ‘extremist’, or ‘alarmist’, or even a ‘left-wing Looney-Tunes conspiracy theorist nutcase’. What you think of this analysis or of the author just doesn’t matter. It won’t change the fact that the Constitution and Bill of Rights are dead. And, here is the thing most Americans don’t understand: without a Constitution, there is no United States of America … America you see, is the Constitution and the Constitution is America. Without the one, the other doesn’t exist. Kick and scream all you want. It’s too late – the game is over, the “good guys” lost. Oh, it’ll take awhile before you and most Americans realize it, but the Constitution and Bill of Rights aren’t endangered, or threatened, or under attack … both are all already dead. If you shoot a deer in the heart, before it keels over, it will run approximately one hundred yards. It takes a little while for the body and brain to realize that the heart is dead. It’ll be like that in America, too. It’ll take awhile before people realize that the Constitution and Bill of Rights have died. The Senate’s cowardly and treasonous act of giving the Executive Branch the legal authority to spy without warrant wasn’t the start of the assault; it was merely the death blow. The real push to eviscerate the Constitution and Bill of Rights began in earnest after 9/11. The FBI can enter your house without a warrant and without your permission, do you know that? The government can read your postal mail without your permission, do you realize that? The National Security Agency can read your e-mail and listen to your private phone conversations, are you aware of that? Maybe someday you’ll decide that you’ve had enough. Maybe you’ll decide to do something about it. Maybe you’ll decide to stand for election on a promise to restore the Constitution. Maybe you’ll have forgotten that when you were 20 years old and your girlfriend was gone for the summer, that you two shared intimate moments on the phone. Maybe you’ll forget, but they won’t and 30 years later, as you embark upon your crusade to finally try and do something about the fascist state of affairs, they’ll have not forgotten and they’ll play your intimate conversation for the world to hear. The Constitution and Bill of Rights are dead. You just don’t know it yet, because the signal from the bullet riddled heart hasn’t reached the body and the brain – but it will, soon.